The 9th of August, 2015 marked 11 years of the OSM project. 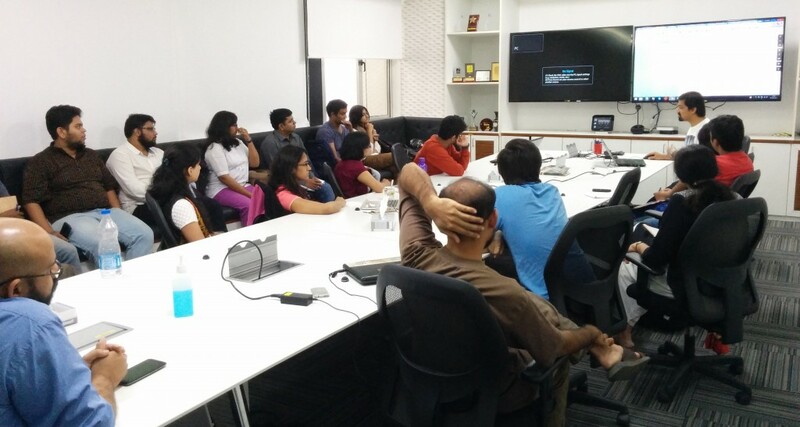 On the same weekend Datameet Pune fittingly held its second meetup, ‘Let’s talk Mapping’. 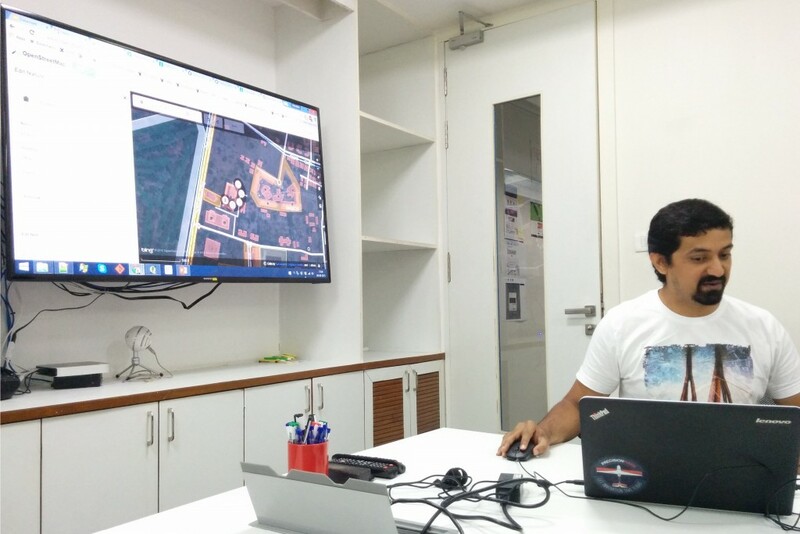 The session was led by Devdatta (Dev) Tengshe, a veteran of the Bangalore Datameet group who has several years of experience in GIS and remote sensing having worked previously for ISRO. 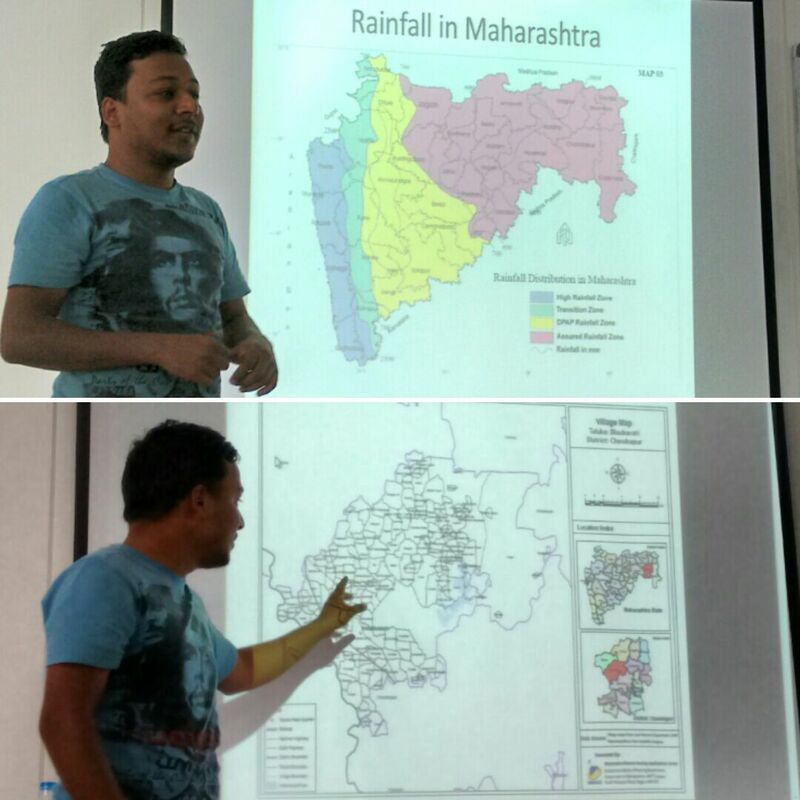 Dev initiated with a primer on what spatial data is and what can be done with spatial data, then followed with an introduction to GIS, a demonstration of OSM and information on sources for spatial data in the Indian context. His presentation can be found here. Below are the highlights of the session. What is spatial data? Its uses? Spatial (data) is not necessarily ‘special’ as many say. It is simply data with a spatial element to it, this could be latitude-longitude but pin codes and postal addresses could be used as spatial formats too. There are numerous advantages to viewing/analyzing social sector data spatially, whether it is census data, land records, city water supply/sewerage networks or other datasets. Spatial representation helps detect patterns and trends that may otherwise go unnoticed. Spatial data in the social sector also comes with its set of challenges. Maps of land parcels for example are not recorded in any standardized way across the country, but instead using local landmarks (turn left at this tree, go straight for 50m, then turn right and head towards the banyan tree) Much of census data is also not easily available at the finer local levels, but only at the district level. Spatial data can be used to solve spatial problems. Spatial data visualizations work with the strength of the human eye, which is to detect patterns visually. In the exploratory stage you may visualize it to detect patterns, e.g. a map of a user’s Facebook friends may unknowingly reveal areas of low internet penetration, a comparison of Bangalore’s bus routes vs Pune’s bus routes show a stark difference in connectivity. In further analysis you may also find spatial correlations. Spatial modelling is yet another application. These processes are in fact the same ones you would use with regular data, and like all other data, spatial data too requires a lot of cleaning. The real world is infinitely complex. To represent this spatial world in data we have to develop simplified models. These can be either Vector or Raster models. In vector models, we use points, lines and polygons to represent real world features (e.g. bus stops, bus routes, ward boundaries) whereas in raster models we use images of the earth’s surface taken by satellites, or UAVs which are composed of pixels to view the earth’s surface. shapefiles are used within desktop softwares (QGIS, ArcGIS), geojson is used for web mapping (these are light, human and machine readable), kml (first developed by Keyhole, later bought by Google) is also a common format. tiff (multiple bands) format allows for storage of larger datasets. Spatial databases are now able to handle spatial data, allows spatial queries related to it, so a user doesn’t have to write out the logic for such operations (e.g. of spatial queries: Find the nearest school/hospital to this village?). Spatial databases are used by retail businesses, housing, utilities and many other commercial ventures. Where do I get spatial data? Data that may be available freely but not in a form that is easily usable and may need to be georeferenced. Spatial data can be ‘scraped’ from websites that contain this data but do not make it easily available, see github datameet maps for examples of data collected from census websites. Although permission may not explicitly be given for this, since it is already up on the web and no copyright exists on the data it is implicitly understood to be open source. The Wikipedia for spatial data, OSM, counts more than two million users who voluntarily contribute to the project. OSM was first aimed to collect just street data, but it has now expanded tremendously. City data in OSM is of high quality however for rural areas, only major roads can be guaranteed. Wikimapia in comparison is limited, it allows you to draw on google maps, but there is no verification of additions and limited data download. There are independent initiatives to make available raw data download from OSM [See slide 47] Similarly other apps use and make available OSM data, Map quest for instance gives directions based on OSM data. If you are unsure of the final use of your data you can download data in OSM XML format, since it contains everything. GeoJSON is useful only when you need shapes, not other features of spatial data. Shapefiles for districts and tehsils are available on Github, Datameet maps. However maps must be verified against other sources of data. In reality there is dispute even within the Indian government on how many districts India has. In reality, in many cases no fixed village boundaries exist, the Census uses blocks and settlements for reference. Some states however make available static maps showing village boundaries that can be georeferenced. Can we divide the country into pin codes? Pin codes do not represent an area, they are points along a line where the postman will deliver. Hence the assignment of addresses to the last three digits of a pin code is a decentralized decision. The lowest level of post offices decides. Pin codes also do not cover the entire country. Post offices to Pin codes do not have a one-to-one relation. Census data at the finest spatial level comes down to census ward boundaries. Nobody outside the census department actually knows these boundaries. Pune city has 700 census ward boundaries (which do not correspond to administrative/electoral ward boundaries) mostly hand drawn. District level offices may have maps with these boundaries as hard copies. Nothing in national policy disallows them from sharing them, but nevertheless government officials aren’t inclined to share such information. Certain limitations however do exist on government data sharing, protected military areas, areas near the national boundaries, topography maps etc. are prohibited. The Open data initiative of the Government of India has created some 5400 odd ‘Open Series maps’ i.e. toposheets without height information. None of these are done digitally or printed. They can however be used with gps data since the lat-long is accurate. Since GoI topography data isn’t made openly available, alternatives available are SRTM, ESTER and Bhuvan Cartosat. These are good for example for larger rural areas, but not feasible for urban areas. Private companies work with UAVs for very high resolution elevation data. For satellite imagery as basemaps, Landsat imagery, going back to 1970 is available. In following up with our discussions on mapping, for those of you who are interested, we have several Pune specific mapping tasks that individuals can contribute to. E-mail us at pune@datameet.org for more information. We hope that everyone found the discussion useful and thank you for coming, thanks to Dev for the informative session! 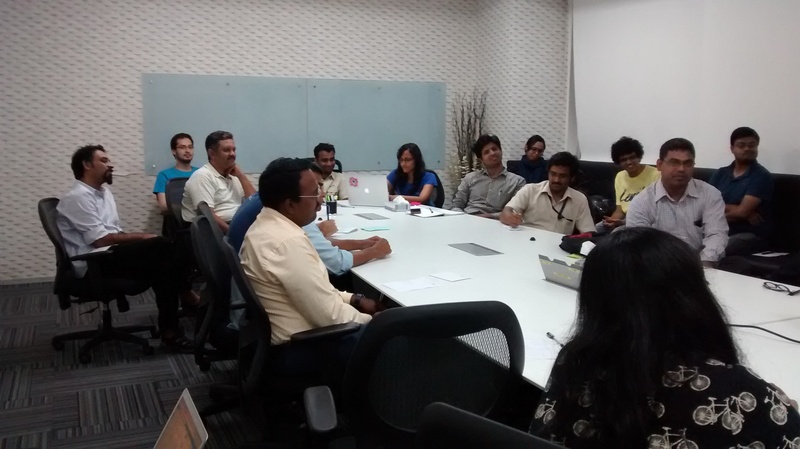 Thanks to Shraddha and Thoughtworks Pune for hosting us. Do connect with us via social media [Twitter] or join our mailing list for information on the next meeting. 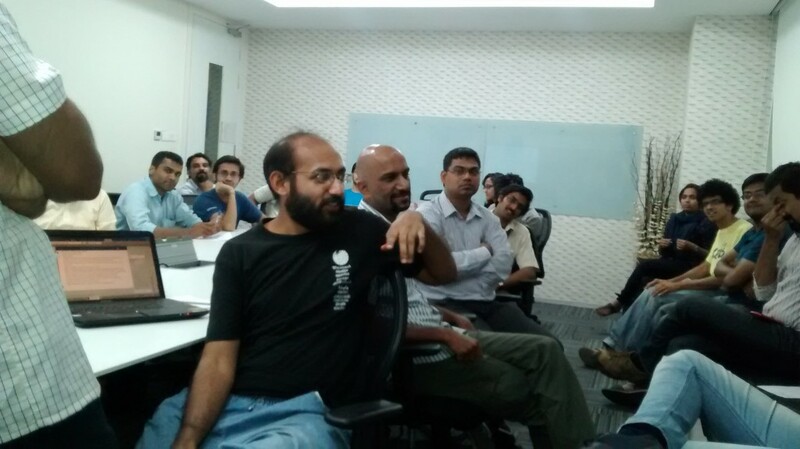 Datameet Pune, hosted its first meetup last Monday, the 13th of July at Thoughtworks, Pune. 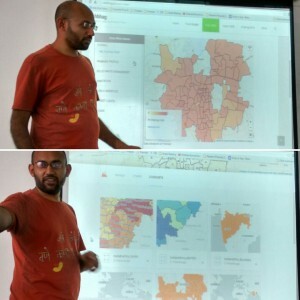 The idea of DataMeet which originated in Bangalore as a community of data enthusiasts, working on civic issues has now spread to several cities across the country, Pune being the latest. Twenty-six people of diverse backgrounds, both from the programming world (students and professionals) as well as those conversant with social sector issues (NGOs and citizens) attended the meeting (including 3 via Google Hangout). A icebreaker and a game of Pune related trivia got the meeting off to a start. Participants introduced themselves and their broad areas of interest. Ideas revolved around public transport, voter registration, land use change, water and sanitation, waste management, education, mapping, data visualization and more. 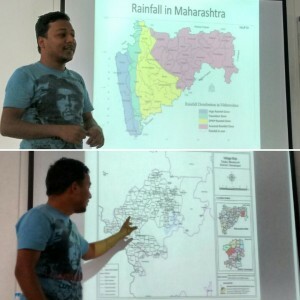 The organizers then gave a brief presentation on the idea of DataMeet, examples of data successes in the social sector elsewhere and the possible scope of projects that can be explored within the Pune group. Nikhil welcomed those interested to pitch in on some of his projects related to Pune’s bus routes management system and Pune’s budget sheet. The floor was then open to the participants to QnA and ideas. Participants discussed the format of further engagement within the group. They agreed that it would be best to start off with monthly meetings organized around topics (related to data and civic issues) where a speaker could initiate discussion based on his/her experience. Topics suggested were mapping, basic statistics, R/Python, better data analysis with Excel, etc. Dev, Vinayak and Rasagy originally from the Bangalore DataMeet agreed to initiate discussions on possible topics. Rahul, urged that the topics taken up by speakers should have a practical orientation rather than being more theoretical, since seeing practical applications tends to interest people more. Sanskriti also suggested sector specific meetups for example on transport, since the Pune public transport service (PMPML) is launching a new BRT route. Participants were briefed about hackathons and Open Data Camps (ODCs) which have happened in other cities and it was suggested that Pune could explore these formats as well. The forum for online engagement of the Pune group, suggested by Vinayak, was Slack.com, to which everyone was agreeable. (a Slack channel was later setup for the Pune group on the main Datameet Slack). For in-person meetings, everyone agreed to meeting once a month, and Saturday was the day agreeable to most, early evening or morning were suggested as possible timings. Additional venues, including CEE, Drive Change, Flame University and Indradhanushya were also suggested. 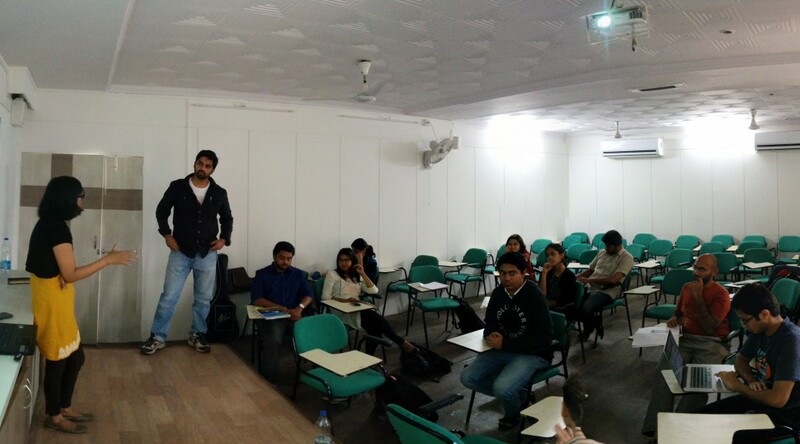 A meetup page was setup by Anurag, for updates about future meetups. Participants were also strongly urged to fill out the DataMeet Pune Interest Form to hear about future activities, available here. The meeting was overall a great success,the participants showing a lot of enthusiasm for actively collaborating together. Please stay tuned for announcements of future meetings. In the meanwhile you can find the Google Hangout recording of the meeting here. For Pune specific queries please email pune@datameet.org or contact Craig/Nikhil.